Acquiring a new customer is anywhere from 5 to 25 times more expensive than retaining an existing customer according to various studies. Also consider this research from Bain and Company, which tells us that increasing customer retention rates by 5% increases profits by 25% or more depending upon the industry. For example, in the financial services industry, the boost of 5% retention rate translates to an increase in profits of almost 25%. A loyal customer base is the true test of a profitable business. In recurring revenue businesses, retention rates make a huge impact on business proﬁtability in many ways. Loyal customers are willing to pay a premium for the products and services, as well as buy more often from the business over time. In addition, they refer their friends and family to the business more often. As these loyal customers generate more business, the operating costs to serve them decline. The combined value of lower cost to serve, higher revenue potential and lower cost to acquire through referrals creates a compounding eﬀect on proﬁts over time. How VOZIQ delivers retention rate gains? Here are the 5 ways in which VOZIQ reduces customer churn signiﬁcantly in recurring revenue businesses such as telecom, cable and internet, insurance, home utilities, and healthcare. VOZIQ provides a closed-loop analytics solution that generates churn predictions from contact center data, and then feeds the insights back into customer handling processes for timely and appropriate actions. From call center/CRM text notes, VOZIQ’s Predictive Text Analytics solution extracts sentiment, call reasons, disputes and competition references along with demographic, usage and billing data to create the most accurate customer churn prediction models. This enables businesses to leverage latest customer interactions and reveal churn risk as it emerges instead of depending upon historical data and trends. VOZIQ’s solution uses customer contacts already happening at your contact center to identify high-risk customers in IVR and re-route them to the highest skilled service professionals for risk recovery. This churn-risk based intelligent routing has enabled many enterprise recurring revenue businesses to boost their contact rate with high-risk customers by as much as 10x. This is a huge gain compared to typical retention email campaigns, which deliver very low engagement. Intelligent routing of higher risk customers to higher skilled agents also prevents long hold times, multiple calls for the same issue or call transfers from agent to agent that result in customer dissatisfaction. VOZIQ’s solution analyzes and sorts the variance between low and high performing agents based on various KPIs including customer satisfaction, prior cancel rates, and ﬁrst call resolution rates. Individual performance is also correlated to call types extracted from the text. These insights, when coupled with intelligent IVR, allow retention leaders to match high-risk calls with empowered and uptrained service specialists with relevant skills. This enables the service specialist not only to engage the customer with due awareness of the risk but also make meaningful oﬀers while the customer is still on the phone. This creates new up-sell and cross-sell opportunities, decreases the churn risk, and boosts customer lifetime value. As VOZIQ leverages the contact center data, i.e. agent notes along with survey data, CRM data, billing data and other available customer data sources using advanced cloud-based text analytics technology, it can eﬀectively ﬁnd the customers who show higher propensity to churn. The cancellation risk scores and cancellation root cause insights help marketing teams to supercharge their retention marketing program by providing targeted oﬀers through email, web and snail mail. Using call center/CRM text notes as a powerful source of customer intelligence, VOZIQ’s engine identiﬁes each customer’s intent, the eﬀort the customer had to make to achieve his intent, and the resulting sentiment. VOZIQ also uncovers root causes and builds correlations between various drivers of customer dissatisfaction and cancellations. Hidden in all this data are insights into products, services, and competitors. These insights give a complete view of customer experience at various stages of the customer lifecycle. 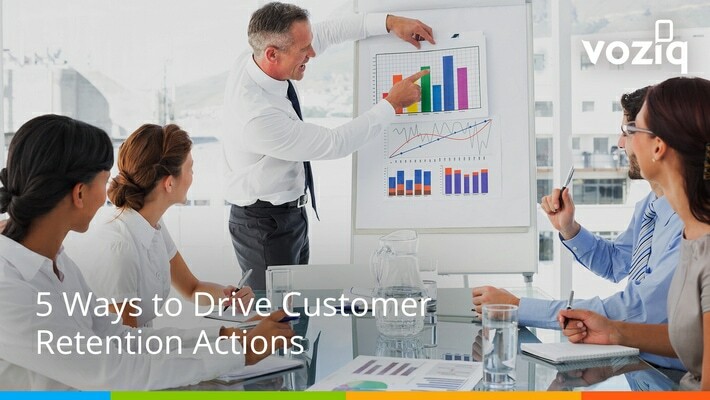 All these insights provide an opportunity for improved customer experience for retention leaders to collaborate with other departments to drive customer-risk aware improvements. Improved sales through personalized oﬀerings. Improved ﬁeld operations with a better understanding of customer experience and risk. Enhanced service through better training and sharing best practices. Improved product by using call center interactions as indirect customer feedback. Enhanced pricing strategies by using customer churn risk drivers and competitive intelligence from your daily customer interactions and advanced text analytics. Takeaway: VOZIQ uncovers hidden churn risk 2X faster! Standard churn prediction models rely on structured data such as customers’ demographics and purchase histories. VOZIQ’s predictive text analytics solutions reduce the time-to-value by going one step beyond these common churn reduction approaches. VOZIQ creates dynamic churn scores through insights extracted from call center/CRM text notes, and offers an end-to-end solution to drive breakthrough retention actions by injecting risk awareness into all customer-facing teams in a recurring revenue enterprise. Click the below image to download the Document in PDF format. Why Is Customer Churn Persistently High Regardless of Companies’ Sustained Efforts? © 2019 VOZIQ. | Actionable Customer Intelligence.